The practice of "Chi Sao" or "Clinging Arms" training is often said to be the heart and soul of wing tsun. That is actually true, because without it, wing tsun would not be wing tsun. It would be something else, entirely, even though it may look the same to casual onlookers. At the most essential level, it could be said that Chi Sao is a training method that puts your body and mind on auto-pilot during a fight, but that would not give the complete picture. It’s more like a combination of auto-pilot and a heat-seeking missile. "Auto-pilot" puts you on a pre-determined course, and as long as you stay on auto-pilot, you stay on that course, no matter what happens. In Chi Sao (and Chi Ger) training, on the other hand, your arms and legs turn into “heat-seeking missiles” in the sense that they learn to naturally spring forward toward your partner’s vital body parts whenever the way becomes free, while sticking or “clinging” to his own arms and legs to keep you from suffering hits while the way is not free. The “auto-pilot” comparison only comes in because that whole process must be trained to become automatic in the sense of being independent from your conscious and linear decision-making process. 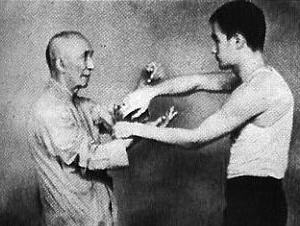 Chi Sao is basically a matter of the interplay of the principles “springing”, “flowing”, and “wedging”. The process starts out with very simple and non-technical exercises that develop this sense of ‘springiness” in your arms. A metal spring does not act on its own. It only reacts to whatever external forces act upon it. In Wing Tsun Chi Sao practice, you train your arms to become live metal springs that freely either thrust forward when there is no obstruction, or stick and bend to oncoming arm attacks until their force is dissipated or diverted. If it is dissipated and the arms begins to withdraw, your arm sticks to it and follows it back toward your attacker’s vital targets. If it is diverted and your arm is suddenly freed, it releases the spring energy it received from the attack and fires it back at the attacker. This “firing back” occurs with your own torso and arms forming a triangular structure that allows your attacks to “wedge” your opponent’s arms aside as you move in with yours. That wedge structure protects your body at the same time as it opens your attacker’s body targets to your forward motion. In Chi Sao practice, both training partners basically learn many different ways and angles and directions of attack and defense in order to let their own “wedge” dominate that of the partners. Chi Sao is just an exercise to train and refine this skill. It is not a “fight” by any means, and it should never be confused with a fight. The entire purpose of it is to make your and your body so familiar with all of the different situations in which tow combatant’s arms can encounter each other that your reaction to what your opponent does becomes faster than you opponent’s. At the same time you learn to make sure that your triangular structure at all times defeats (opens up) that of your partner’s. All of this happens in progressive stages of complexity, with offensive and defensive footwork, at first slowly, and then ever faster and more and more supple and flexible until even the slightest change in direction or energy of your opponent’s attack is detected by your nervous system, correctly interpreted by the subconscious parts of your brain, avoided or neutralized, and returned to your attacker once the way is freed. Needless to say that, eventually (but far sooner than you expect), all of this happens, virtually by itself, in tiny fractions of a second. The end result is that you develop the ability to easily and quickly neutralize even the heaviest and fastest attacks while firing off your own. In the end, you learn to quite literally add your attacker’s power to your own as you let him run into empty space while “greeting” him with your counter, literally helping him to “impale” himself on your counter-attacking arms as he rushes in. He is a perfect example of how a smaller WT fighter can deal with much taller and stronger attackers. He moves like a cat. The goal of Chi Sao practice is always improved and honed fighting ability, but the practice should never be confused with the reality. In Chi Sao, you learn from your opponent. In fighting, you destroy your opponent – or he destroys you. That is the difference that should never be forgotten. Chi Sao is like fighting with a wooden sword. You wouldn’t take a wooden sword into battle against a blade-encrusted army, would you? Please fill in all fields followed by an asterisk to get your free week.